Of the Twelve apostles there were four blood brothers: Peter and Andrew, and James and John. 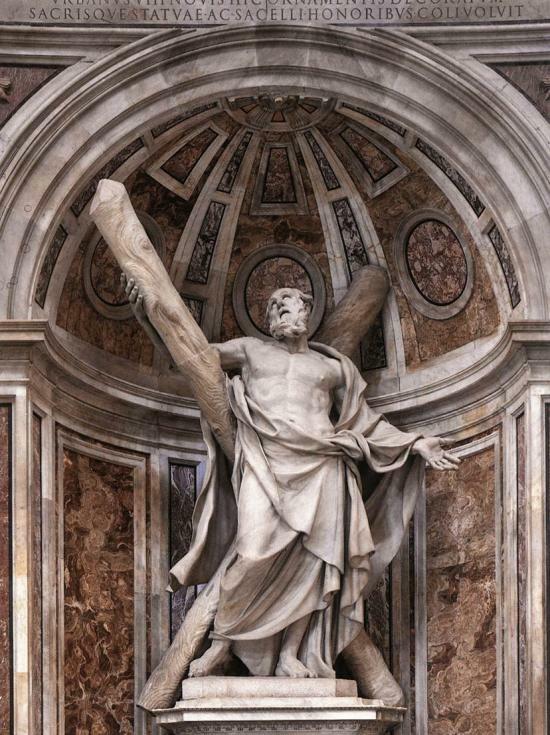 Today in celebrating the feast of St. Andrew, St. Peter’s brother, we are also celebrating a brotherhood in the Lord that every believer dreams of for his family. In John’s Gospel it was Andrew who first met Our Lord, and then introduced him to Peter. Having a brother who not only shares your blood, but also your faith is a blessing indeed. Even more beautiful is a brother who can help you discover your vocation. For Andrew this brotherhood in Christ went beyond his immediate family. When some Greeks wished to speak with Our Lord, they went to Andrew. Andrew represents the brotherhood between the Greek-speaking Eastern Churches and the Latin-speaking Western ones. Let’s pray today for families to be not only families of blood, but families of faith, so that they can help each other to discover God’s plan in their lives. Readings: Romans 10:9–18; Psalm 19:8–11; Matthew 4:18–22. Today there’s a change in color in the liturgy to celebrate a change of season. It’s not just that the weather is getting colder: today we begin a new season in the liturgical year, and a new liturgical year. Yesterday, the end of a liturgical year, symbolized the end of time when Christ will come to definitively overthrow sin and death so that we can live forever with him and everyone we love. Last Sunday we celebrated that by celebrating the Solemnity of Christ the King. This Sunday we are beginning the season of Advent. “Advent” means “coming.” Last Sunday we celebrated the Second Coming of Christ, which is going to come in the future. During Advent we prepare to celebrate the First Coming of Christ: Christ’s first coming happened on Christmas. Actually, it happened at the Annunciation, which was when he became man, which is why it is also called the feast of the Incarnation, but he was born at Christmas, which is also called the feast of the Nativity. During the liturgical year we celebrate all the mysteries of Christ’s life, from the beginning of time, even before he became man and came to earth, until the end of time, when he will return in glory. We also celebrate the whole history of salvation during the liturgical year. In Advent we celebrate the start of the history of salvation from the beginning, but before Christ’s First Coming to earth at the Incarnation. In today’s Gospel Jesus is talking about his Second Coming, but the question for both Comings of Christ is the same question: Are you ready? How do you answer that question? It’s going to influence how you live Advent a lot. Is it “finally!”? Is it “yeah, right…”? Is it “yikes”? Those answers are not answers to what gifts you’re going to get, what family members you’re going to see, or how much you’re going to eat: they’re answers to how you are getting ready for Christ’s coming at Christmas. Christians are often on the fence: Some have the same attitude as the Israelites and the skeptics, but others are saying, “yikes,” because the Second Coming is all they have on their mind, and they know they’re not ready. At Christmas we’ll be celebrating the fact that God is with us as one of us. We have to do our part, we have to change our lives, but helped by him, sorry for our sins, but joyful in knowing he is near, ready to save us from them. Let’s get ready for Christ’s coming by rejoicing. The Lord is giving you a whole liturgical season – three weeks — to reflect on what you’ve done and could have done better so that he can help you draw closer to him. Ask him to help you keep him in the center of your preparation for Christmas. Christmas is going to be a time for family, friends, and rest, but it is also a time for rejoicing, because the Savior of the World, our Savior, is going to be born. Let’s live Advent with a spirit of gratitude, contrition, and joyous expectation. Readings: Jeremiah 33:14–16; Psalm 25:4–5, 8–10, 14; 1 Thessalonians 3:12–4:2; Luke 21:25–28, 34–36. See also 34th Week in Ordinary Time, Thursday and 34th Week in Ordinary Time, Saturday. The end (of the liturgical year) is upon us, and in today’s Gospel Our Lord encourages us to keep the big picture in mind. It is salutary to ask ourselves once in a while if what we are doing or worrying about right now would matter if the world were to end today. That question is salutary not only for party animals concentrating on a prolonged escape from life and its responsibilities by leaping from thrill to thrill, but also people who bury themselves in their work and their immediate pressing concerns, hoping that down in that foxhole nothing that explodes in life will affect them. Experience shows that reality can get up close and personal at times, and blow up in our faces no matter how much we ignore it or put it far down on our to-do list. In these last few weeks we’ve considered Our Lord’s invitation to persevere in trials, to hope in the face of evil, to be realistic in acknowledging that challenges will come, to be vigilant, and to have courage in facing and overcoming challenges. It will be a long haul, not easy, and full of lights and shadows, but it’ll be worth it. Welcome to life on earth. Keep the big picture in mind and you’ll know that good will triumph and that you’re not alone: your fellow believers will support you, and Our Lord himself. Readings: Daniel 7:15–27; Daniel 3:82–87; Luke 21:34–36. The Kingdom of God is established “now”: it was near, and those who believed in Jesus and his preaching became the first signs in the world of that Kingdom, and he entrusted his disciples with the mission of continuing to announce that it was near. All disciples of Jesus are signs and members of the Kingdom of God. The springtime of new life starting to bloom has come with our baptism and Christian life. Saint John Paul II expressed the desire that the third millennium be a “new springtime” for Christianity. The time of the Church, until Our Lord’s return in glory, is that springtime. At the same time, the Kingdom of God is “not yet” complete. It cannot be until every person throughout history has had an opportunity to welcome it or reject it, and that won’t happen until the end of time. The Kingdom of God is “not yet” a complete conquest and exile of all the evil influences in the world; that will come at the end of time with the Last Judgment. The Kingdom is “now” and “not yet”: let’s live our faith as a spring with an eager anticipation of the beautiful summer to come for those who welcome it. Readings: Daniel 7:2–14; Daniel 3:75–81; Luke 21:29–33. In today’s Gospel we catch a glimpse of an evangelist who was not an eye witness to everything Our Lord said. Luke’s account of Our Lord’s prediction of the destruction of Jerusalem and the Temple takes into account not only what Our Lord taught, but how the first generation of Christians understood it when it happened. They could have easily fallen into doubt about what Jerusalem’s impending destruction at the hands of the Romans meant, which is why Our Lord told them to flee, knowing that while that moment was the end of “a” world, it not the end of “the” world. Our Lord interweaves his predictions regarding the Temple with teaching on his Second Coming, the return of the Son of Man in power. As we’ve already seen this week, cultural, social, and even cosmic upheavals will take place, and they’ll be terrifying, but they won’t immediately be the end. Today Our Lord describes his return using the imagery of the Book of Daniel, a language every Jew of his time would understand. As he reminds us, when he returns in glory, a Christian has no need to cringe or to cower, because redemption is at hand: deliverance from pain, suffering, evil and fear. As Christians we know his mercy endures forever. The only people who need to be afraid of Our Lord’s return are those who reject his message or his mercy, and we pray for them always to welcome the Gospel and to welcome true and lasting happiness. Let’s ask Our Lord today to help us identify those moments of upheaval in our lives and to discern whether it is a moment to stand tall, seeing God’s hand at work to deliver us, of retreat, knowing some evil is beyond our ability to address, or of defeat, asking Our Lord for his intervention and his mercy. Readings: Daniel 6:12–28; Daniel 3:68–74; Luke 21:20–28.